Provide comfort for the family of Alice Desloges with a meaningful gesture of sympathy. We are deeply saddened to share the news that our beautiful mother and precious grandmother, Alice Desloges has passed away peacefully, at the age of 92 in Chelmsford, Ontario. She was predeceased by her husband Robert Henry Desloges and son Paul Emile Desloges. She was also predeceased by her sister Nina Cooke and brothers Lomer, Stephen, Alex, Wally, Robert, Marcel and her parents Jean Lomer deBlois and Alice (Wallingford) deBlois. She leaves behind her children Stephen of Cochrane, Corinne (late Larry) Breathat of Cochrane, Elise (late Kenneth) Hannah of Sudbury, Patricia (Douglas) MacMillan of Timmins, Gail (late Mark) Norquay of Sudbury, Jane Desloges of Toronto and John (Karen) of Trenton, 17 grandchildren and 16 great grandchildren, all of whom, she loved very much. She will also be deeply missed by many nieces, nephews, other relatives and friends. Relatives and friends are welcome to visit at Irvine & Irvine funeral home 149 Third Street West, Cochrane, on Friday February 8th, 2019 7 pm to 9 pm and on Saturday February 9th, 2019 from 9:30 am to 10:30 am. The Mass of Christian burial will be celebrated at Transfiguration Church on Saturday February 9th, 2019 at 11am with Father Richard Fortin officiating and reception to follow in the parish hall. The interment will be held at the Cochrane Catholic Cemetery in spring. 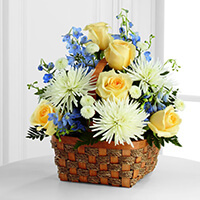 To send flowers in memory of Alice Desloges (deBlois), please visit our Heartfelt Sympathies Store. Gord, Carole, Vanessa, Renee and Tomasz and The Desloges Family have sent flowers to the family of Alice Desloges (deBlois). To my cousins I send my deepest condolences. Aunt Alice was so sweet and many of my siblings remember her fondly. She was a beautiful lady. Always gracious and welcoming. She will be remembered for her kind disposition by her nature. Thinking of everyone in these difficult times. Our thoughts and prayers are with all of you. Our most sincere condolences. 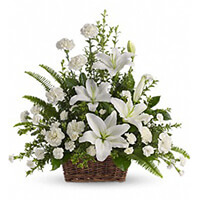 Gord, Carole, Vanessa, Renee and Tomasz purchased the Peaceful White Lilies Basket for the family of Alice Desloges. Our sympathies go out to Mrs. Desloges' family and especially to Minnie and Jane. We will always remember your Mom as a very kind, gentle lady with a great sense of humour. My Mom loved spending time with her while they both lived at the Chateau Georgian. Please know that you are all in our thoughts and prayers. Take care! The Desloges Family purchased the The FTD Heavenly Scented Basket for the family of Alice Desloges.